Mesothelioma is an aggressive disease and a rare form of cancer that attacks the protective tissue lining of internal organs. In the medical community, it is understood that there are many ways to treat all the various types and forms of cancer, but there is no known official cure. Unfortunately, mesothelioma is no acceptation to this either. Although there is no cure, over the past 5 – 10 years, treatments have become more advanced and the life expectancies of cancer patients have indeed extended and the people diagnosed with mesothelioma can absolutely benefit from these advances. 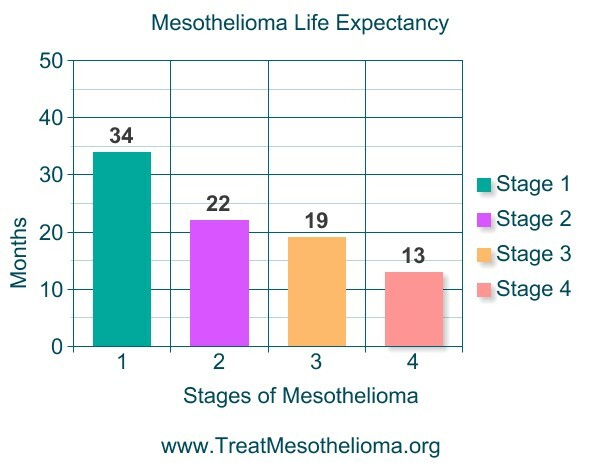 Here is an excellent video that talks about the prognosis and life expectancy of Mesothelioma. Knowing and understanding the prognosis, life expectancy, and mesothelioma survival rates is very important. It can be the difference between either encouraging and providing the push for motivation to fight the disease or having the patient lose all hope and give up. For this reason, let’s try not to look at these numbers emotionally but rather clinically and statistically. How many mesothelioma cases end in a fatality? Once diagnosed with mesothelioma, 55% of the cases live for more than 6 months. By the end of the year, 33% of the patients are still alive. After the second year, that percentage drops to 20%. By year three, only 8% of patients are still alive, and that number continues to drop. What factors affect these rates? There are many factors that determine the likelihood of survival, with the most important factor being physical. First, the site of the tumor is crucial, pleural mesothelioma has lower survival rates when compared to peritoneal mesothelioma. Other locations affected by mesothelioma, like the testicles and the heart, have similar survival rates. Second, the stage of the cancer is a big factor. Early detection increases the chances of survival not only because cancer hasn’t spread, but also because there are more treatment options available. Unfortunately, mesothelioma is almost always detected when it has already progressed to the third or fourth stages, when symptoms are first noticed, and treatment options are narrowed. Another important factor is the age of the individual. Studies have shown that younger adults have a better chance in comparison to seniors. The overall survival rates have produced the following percentages. Mesothelioma patients 45 years old or under have a 20% chance of surviving for over a decade after diagnosis. Mesothelioma patients 65 or over have less than a 1% chance of surviving for over a decade. The histology (the cell type) of the patient is a factor as well. There are three cell types that can be affected: Sarcomatoid, Epithelioid, and Biphasic. All of these statistics and percentages should be taken simply as an estimate. The reason I say this is because these survival rates are determined by past statistics. Therefore, these statistics and numbers should not discourage you. There are many new medical procedures, mesothelioma treatment options, as well as a much better understanding of this type of cancer in general. This allows the patients to live longer than ever before. Current clinical trials that are being conducted have shown promising results, and perhaps soon there will be an effective treatment option here in the next year or two. Keep in mind that these past statistics don’t apply to the future either, and we must always have confidence in not just ourselves, but also in the scientists and researchers who are searching for a cure. Ashley Stafford is a volunteer online blogger for treatmesothelioma.org. She has a very special interest in helping Veterans as her father served in the Navy. Along with donating her time to help our armed forces, she has an extreme curiosity in all types of rare diseases, especially cancer. One of her goals is to learn as much about cancer and the various treatments available in hopes raise more awareness on what may or may not be kept secret to the general public.